and loads and loads of relevant information. Gone are the days when your travel companions only used to be those printed guidebooks.The world has become much simpler since then,and is certainly just a click away.Ever wondered the benefits of not having to carry those books,and instead a small lightweight Kindle sometimes to kill time on those awkward moments of loneliness(Being in a flight for example/staying in a new place for long time like for months) or to go through details of information which is only available inside the books(The Travel Guidebooks for example).You will ask me,why do I need it,when I have my Smartphone or iPhone?But I would say,if you are a traveler who would rather rely on The Guidebooks to just any random reviews/information on internet you need a platform that makes browsing those guidebooks easier.I am still relying on Lonely Planet for my Greece trip next to next month because the local information it has, is still not available on internet.I might buy Rough Guides too.Carrying the printed copy of course would be a hassle as it will add on to the weight.When I travel,I love travelling light.And when a Kindle can exactly do what a book does,its much convenient too.Also the books on Kindle are comparatively more cheaper,compared to buying the whole on print. 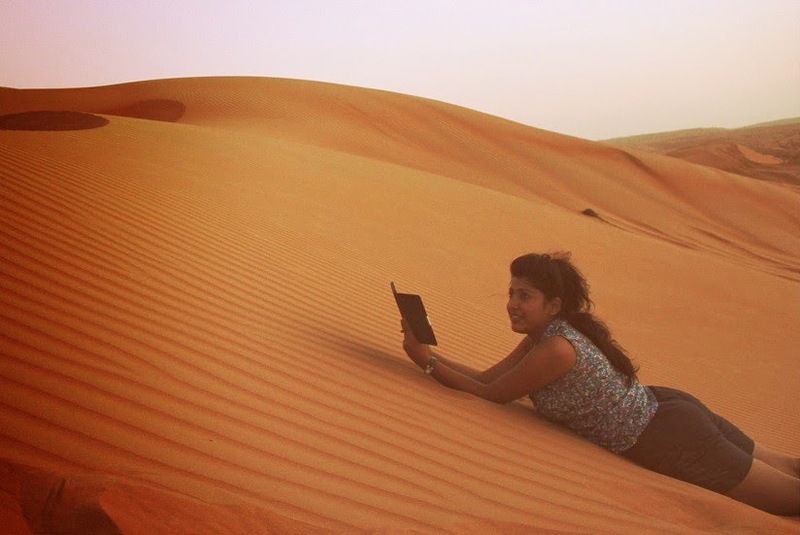 The world is a book and those who do not travel read only a page! 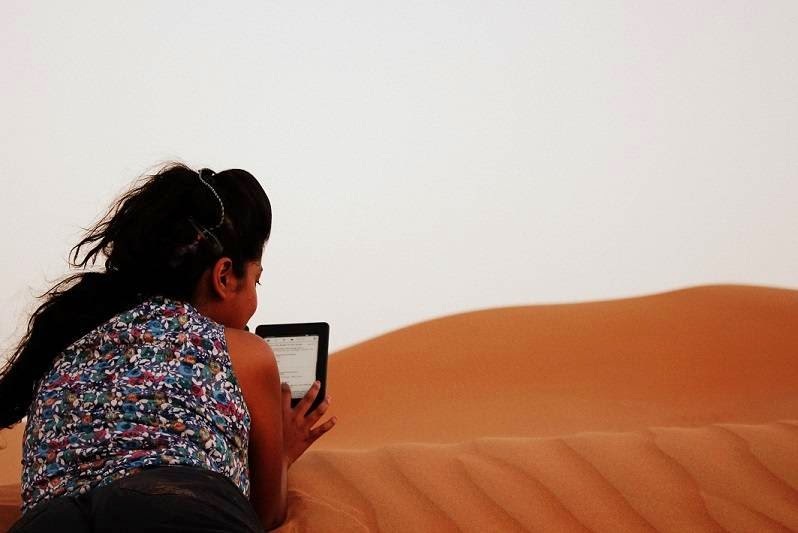 With Amazon Paperwhite,you can download the book of your choice,and choose reading an interesting friction/story instead in an otherwise boring flight journeys.During my latest trip to the beautiful Oman,I just went through the online guidebooks on Oman to know what Oman has to offer just about anywhere I had the wifi. It's like live streaming of information without having to bother about its weight.And weight as you all know does matter during travel.The more you travel,the lighter you would want your travel to be! Something just about anything to read. Starting the 4th Feb 2014, you can buy the new advanced Kindle Paperwhite on www.amazon.in or at 250 retail outlets across India including Croma, Reliance Digital, E-Zone, and Vijay Sales stores located in Delhi, Mumbai, Chennai, Kolkata, Bangalore, Hyderabad, Chandigarh, Ahmedabad and Pune. Weighing only 206 grams, the new Kindle Paperwhite offers a vast collection of books at high-quality display technology, all-new reading features, faster speed, and a stronger battery backup. The Wi-Fi enabled Kindle Paperwhite is priced at Rs. 10,999 while the Wi-Fi + 3G version is priced at Rs. 13,999. 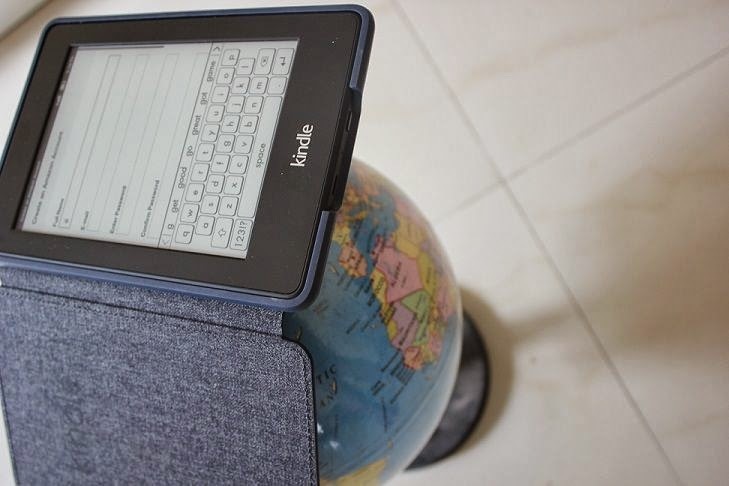 Kindle has been the best-selling e-reader in the world for the last six years, and the advanced model packs better features into the device, further improving user experience. The features of the new Kindle Paperwhite make it a great learning tool for kids, a traveler’s best companion and a book-lovers in-house library, the New Kindle Paperwhite offers all that a reader would want in an e-reader. New display technology—Higher contrast and better reflective means whites are whiter and blacks are blacker. New, 25% faster processor—Books open and pages turn faster for a seamless reading experience. New touch technology—19% tighter touch grid makes Kindle Paperwhite respond even more accurately to the smallest touches. New Kindle Page Flip—Skip page-by-page, scan by chapter, or skip to the end of your book, all without losing your place. New Goodreads Integration—Combines the world’s largest e-reading community and the world’s largest community of book lovers. New Vocabulary Builder—Compiles words you look up in the dictionary into an easy-to-access list. New In-line Footnotes—With a single tap, read the complete text of each footnote in-line without changing the page or losing your place in the book. Access to 8 million books and 2+ million eBooks. Indian customers can enjoy over 600,000 books priced Rs.200 or less and over 1.2 million priced Rs.600 or less. 1. Download a book that has a lot of helpful reference information. A Dance With Dragons by George R. R. Martin is a great choice. 2. When you need to reference information either at the beginning or end of the book (like the map of Beyond the Wall in A Dance With Dragons) tap the screen to bring up chrome in the reader and then tap the bottom bar. You can now easily flip backwards or forwards. 3. When you’re done, simply tap the “X” at the top of the screen to return back to your original place in the book. 2. Look up a phrase (such as “credit default swaps”)—you’ll notice that Smart Lookup recognizes this is an important topic and phrase in the book, and gives you the correct definition via X-Ray. 3. An ordinary dictionary would have given you the individual definitions of each word (i.e. “credit,” “default,” and “swaps”). 1. Find and download a book that has a lot of useful footnotes. A great example is The Signal and the Noise by Nate Silver. 2. Tap on a footnote to see the information in a pop-up window on your screen. Tap on the link at the end of the footnote preview text to be taken to the full footnote or tap the “X” at the top of the screen to return back to your original place in the book. Did you know? Amazon’s Whispersync technology saves and synchronizes your last page read, vocabulary words, bookmarks and annotations across all of your devices, so you can always pick up where you left off. Content Formats Supported: Kindle Format 8 (AZW3), Kindle (AZW), TXT, PDF, unprotected MOBI, PRC natively; HTML, DOC, DOCX, JPEG, GIF, PNG, BMP through conversion. @thetalesofatraveler.com: Ah,Lucky him.So when is your Birthday? You can ask him to gift you a kindle(with lots of books)...It's a very useful stuff! Thanks for sharing Kindle features and benefits!! !